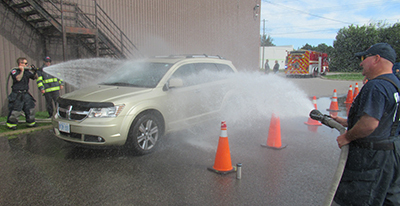 Members of the Orangeville Fire Department this past weekend hosted a special car wash fundraiser in honour of one of their fallen brothers. Approximately two dozen local firefighters came together on Saturday (Sept. 8) from 9 a.m. to 2 p.m. at the Orangeville Fire Hall on Dawson Road to raise money for the family of Owen Sheardown, who passed away on Feb. 26 following a short battle with cancer. In total, they managed to raise more than $6,000. Despite only being with the department “for a short time”– just under five years – Orangeville Fire Chief Ron Morden said Owen made a huge impression locally. As a volunteer with the Fire Department, Mr. Sheardown was fully trained in all aspects of firefighting. He specialized in auto extrication, becoming so well-versed that he was tasked with teaching his fellow firefighters about the different tools and techniques involved in that aspect of the job. Chief Morden described Owen as a sponge – wanting to absorb as much information and knowledge as possible during his time with the local department. A self-employed IT specialist during the day, Owen was always on the lookout for new technology that could help the department improve in its firefighting capabilities. Chief Morden recounts many instances when Mr. Sheardown would walk into his office and ask about certain pieces of equipment, some of which the chief says didn’t exist at the time. When Chief Morden first learned of Owen’s sickness and, subsequently, his passing, he knew the department had lost one of its leaders. More importantly, a family had lost its figurehead. In his passing, Mr. Sheardown left behind three children – Makayla, Evander and Logan and two stepchildren – Addison and Carly. He died just two days after his 42nd birthday. Now, with Owen gone, Chief Morden says his second family wants to do whatever it can to “do right” by one of their brothers.